Well, the computer is finally up and running! Its been working fine since we got it back. So ~ today I thought I'd use it to post on this little neglected blog of mine!! The March theme for my sisterhood's monthly swap is GREEN. Which just happens to be a color I have a love hate relationship with. I LOVE the color, I HATE everything I make with it! LOL!! The theme however, presented a lovely challenge for me. First of all, I didn't own anything that I could color green. Okay, that's obviously not true. I don't own anything i wanted to color green - I wanted to buy something new (HEY HEY NOW! I know you do it too!). It gave me the perfect excuse to purchase one of the new images from High Hopes stamps by thier new designer - ya, I'm talking about Dustin Pike! So I decided that I would happily add Troubled Travis to my collection of rubber goodness. Now, this also presented a problem! I have never colored a dragon before! And most certainly not with my limited collection of Copic markers. So I pulled out every green I have (a total of 4) and a couple of warm earths hoping it would work out. One thing you gotta love about Copics is the ability to blend the colors and create the look you want. While I still think i NEEEEEEED more colors, the ones I have have served me pretty well for the short year that I have been coloring with them. 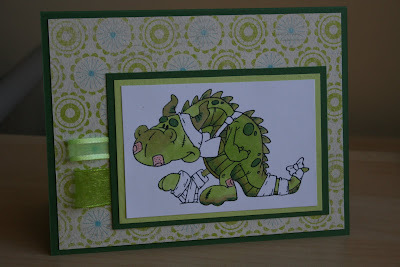 So.. here is my card for the swap - hope you likee!! I whipped up a quick get well card. The sentiment inside is computer generated (OH YEAH I GOT MY PRINTER WORKING TOO!) 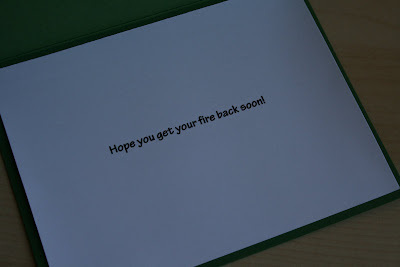 and says "Hope you get your fire back soon!" ~ Special thanks to Christyne for the freebies! Click the link on my sidebar for your chance to enter! I have another announcement! We FINALLY have a working computer again. We took our old dinosaur to the doctors, had her stripped naked & re-vamped with all sorts of goodies! The old laptop is officially "dead". So, I'm working diligently to get going on all things blog and stamp and email and what - not so you should stand by!